The Jaguars and the Carolina Panthers joined the NFL as expansion teams for the 1995 season. Since their inception, the Jaguars have won division championships in 1998 and 1999 (as members of the now-defunct AFC Central) and 2017 (as members of the AFC South) and have qualified for the playoffs seven times, most recently in 2017 after a ten-season playoff drought. From their inception until 2011, the Jacksonville Jaguars' majority owner was Wayne Weaver. The team was then purchased by Pakistani-born businessman Shahid Khan for an estimated $770 million. In 2015, Forbes estimated the team value at $1.48 billion. Jacksonville was considered the least likely expansion candidate for several reasons. The Jacksonville metropolitan area and television market were smaller than those of nearly every team in the league. Jacksonville was the 54th largest television market, and only Green Bay had a smaller TV market (Jacksonville has since moved up to 42nd, trailed by New Orleans, Buffalo and Green Bay.) Although Jacksonville was the 15th largest city in the nation at the time (It has since grown to become the 11th-largest), it has always been a medium-sized market because the surrounding suburbs and rural areas are far smaller than the city itself. There were 635,000 people in Jacksonville proper according to the 1990 census, but only 900,000 people in the metropolitan area. Additionally, the Gator Bowl was outdated, and the ownership group struggled to negotiate a lease with the city. The troubled negotiations over the Gator Bowl lease led the ownership group to withdraw from the NFL expansion bidding in July 1993. After the Gator Bowl game on December 31, 1993, the old stadium was essentially demolished and replaced with a reinforced concrete superstructure. All that remained of the old stadium was the west upper concourse and a portion of the ramping system. To accommodate construction, the 1994 and 1995 games of "The World's Largest Outdoor Cocktail Party" were split between the home fields of Florida and Georgia, and the 1994 Gator Bowl was played at Ben Hill Griffin Stadium in Gainesville. In January 1994 Wayne Weaver chose Tom Coughlin as the first-ever head coach of the Jaguars. Coughlin had worked in the NFL as a position coach, but he had been neither a head coach nor a coordinator in the NFL. Along with the Carolina Panthers, the Jacksonville Jaguars entered the NFL as the first expansion teams in almost 20 years. 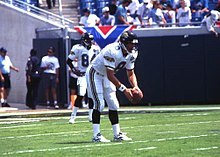 Both teams participated in the 1995 NFL expansion draft, with the Jaguars taking Steve Beuerlein with the first pick. Beuerlein quickly lost his starting job to former Green Bay Packers backup Mark Brunell. The Jaguars finished their inaugural season with a record of 4–12. Both the Jaguars and the Panthers (7–9) broke the previous record for most wins by an expansion team (3) set by the Cincinnati Bengals in 1968. The inaugural season featured many of the players who would lead Jacksonville into the playoffs in the team's next four seasons, including quarterback Mark Brunell (acquired in a draft day trade from Green Bay), offensive lineman Tony Boselli (drafted with the 2nd pick overall in the 1995 NFL Draft) running back James Stewart (also drafted in 1995), and wide receiver Jimmy Smith (signed as a free agent). The team played its first regular season game at home in front of a crowd of 72,363 on September 3, 1995, a 10–3 loss against the Houston Oilers. The team picked up its first win in Week 4 as the Jaguars defeated the Oilers 17–16 on October 1 in Houston. The next week against the Pittsburgh Steelers, the Jaguars earned their first home win by defeating the eventual AFC Champions 20–16. The team's other two wins came in a season sweep of the Cleveland Browns including a Week 17 24–21 victory sealed by a Mike Hollis 34-yard field goal in the Browns' final game before the team relocated to Baltimore and was renamed the Ravens. The Jaguars visited the Buffalo Bills in their first playoff game in franchise history. Despite being a heavy underdog, the Jaguars won 30–27, and knocked Buffalo quarterback Jim Kelly out of what would turn out to be the last game of his career. Their next game was on the road against the Denver Broncos, who had earned the AFC's top seed with a 13–3 record and were widely regarded as the best team in the AFC, if not the NFL. While the Broncos scored two touchdowns early in the game, after the first quarter, the Jaguars largely dominated. In what is often regarded as one of the three biggest upsets in NFL playoff history, the Jaguars defeated the Broncos by the same score as the previous week against the Bills, 30–27. Upon their return home, the Jags were greeted by an estimated 40,000 fans at the stadium. Many of these fans had watched the game on the stadium JumboTron displays and had stayed into the early hours of the morning when the team arrived. In the AFC Championship Game, the Jaguars miracle season came to an end, as they lost 20–6 to the New England Patriots, in Foxboro. Their fellow second-year NFC expansion team, the Carolina Panthers, also got to their conference championship game, where they lost 30–13 to the eventual Super Bowl champion Green Bay Packers. The Jaguars' bid for a Super Bowl title came to an end the next week in the AFC championship game. The Jags fell at home to the Titans 33–14 in a game that the Jaguars led 14–10 at halftime, before allowing 23 unanswered points in the 2nd half. The Jaguars finished the 1999 season 15–3, with all three of their losses coming against the Titans. The loss marked the end of an era that saw the Jaguars make the playoffs in four of the team's first 5 years and would be the team's last playoff appearance until the 2005 season. Head Coach Jack Del Rio set an NFL-record for consecutive seasons (9) coaching a team without once winning a division title. Reggie Nelson hitting Reggie Wayne of the Indianapolis Colts on Monday Night Football in 2007. Josh Scobee is the all-time leading scorer for the Jaguars with 1,022 points. The 2004 season, the 10th season of the Jaguars franchise, resulted in a 9–7 record, their first winning season since 1999, with road victories against the Green Bay Packers at Lambeau Field and the Indianapolis Colts at the RCA Dome. The Jaguars' defense was a strong suit, as it included two Pro Bowl players, defensive tackles Marcus Stroud and John Henderson. Josh Scobee was selected in the 5th round of the 2004 NFL Draft and became a dominant placekicker for the Jaguars setting multiple franchise records. Byron Leftwich enjoyed a solid year in 2004, helped by strong performances from holdovers Fred Taylor and Jimmy Smith. Unfortunately, Taylor sustained a season-ending injury at Green Bay. The very next week the Jaguars fell to the Houston Texans, which would ultimately eliminate them from playoff contention. In the 2007 NFL Draft, the Jaguars used their first-round pick (21st overall) to select Florida safety Reggie Nelson. On June 15, 2007, the Jaguars released veteran strong safety Donovin Darius, who had seen diminished playing time in previous years due to mounting injuries. On August 31, 2007, the Jaguars announced that long time back-up quarterback David Garrard would start for the team, ahead of former first round draft pick Byron Leftwich, who was released in the team's final roster cuts. Garrard led the Jaguars to an 11–5 record and a wild card spot in the playoffs. The Jaguars defeated the Pittsburgh Steelers 31–29 to win their first playoff game in almost eight years and their first road playoff win since 1997. It was also the first time in the 50+ year history of the Steelers that they had been beaten twice at home by the same team in the same season. However, in the divisional round, the Jaguars fell to the then-undefeated New England Patriots; the teams were tied at halftime, but the Patriots pulled ahead and won 31–20. Tom Brady completed 26 of 28 passes in this game, being pressured by the Jaguars' defense only once, on the first play. This game, more than any other, gave the Jaguars' front office a strong desire to upgrade the pass rush during the offseason. However, the Jaguars failed to live up to those expectations, struggling to a 5–11 finish, the franchise's worst record since 2003. The team's struggles were in part, the result of a rash of injuries to the team's offensive line. The Jaguars lost starting guards Vince Manuwai and Maurice Williams for the season within the first quarter of the opening game. Tackle Richard Collier's career ended in early September when he was brutally attacked and shot 14 times. Center Brad Meester missed the first two months of the season and guard Chris Naeole, signed to the roster mid-season in response to these injuries, was injured in pregame warmups before playing a single snap. The 2008 season marked the end of running back Fred Taylor's 11-year career as a Jaguar. Taylor, who is considered to be one of the greatest Jaguars in the history of the franchise, rushed for over 10,000 yards during his tenure with Jacksonville and earned one trip to the Pro Bowl. In 2009, he signed with the New England Patriots. Taylor's departure opened up the door for Maurice Jones-Drew to become the team's feature running back. In 2011, Taylor signed a one-day contract so he could retire as a Jaguar. The Jaguars entrance during a 2009 preseason game. Wells Fargo Center with their "Go Jaguars" lighting for the 2011 season. The 2010 season proved a big year for the Jaguars on the field as well. Running back Maurice Jones-Drew emerged as second in the league in rushing yards and David Garrard threw for 23 touchdowns, a franchise record. Marcedes Lewis went to his first Pro Bowl and the Jags had one of the best young defensive tackle pairs with Terrance Knighton and rookie Tyson Alualu. Josh Scobee set a team record with a 59-yard field goal to beat the Indianapolis Colts. Heading into December, Jacksonville was at the top of the AFC South and in playoff contention. In Week 15, they lost to Indianapolis, 34–24, which placed the Colts back atop the AFC South. The Jaguars lost their last two games, placing themselves out of playoff contention. They finished the season 8–8. On November 29, 2011, owner Wayne Weaver announced the firing of head coach Jack Del Rio, whose record had been 3–8 through the first 12 weeks of the season and 68–71 over his 9-year tenure. Del Rio was succeeded by defensive coordinator Mel Tucker on an interim basis. Weaver also announced that General Manager Gene Smith had been given a three-year extension of his contract. Immediately following the announcement of Del Rio being fired, Weaver also announced that the team would be sold to Illinois businessman Shahid Khan. Khan's assumption of ownership was approved a couple of weeks later by the NFL team owners, and Khan took over full ownership on January 4, 2012. He immediately began the team's search for head coaching candidates. On August 21, 2012, the Jaguars announced they had finalized a deal to play one regular season home game each year between 2013 and 2016 at London's historic Wembley Stadium as part of the NFL International Series. The first of these games was against the San Francisco 49ers on October 27, 2013. This deal was later extended through 2020. Jaguars take the field at their NFL International Series game at Wembley Stadium in London on October 27, 2013. On January 8, 2013, former Atlanta Falcons Director of Player Personnel David Caldwell was hired as the second full-time General Manager in Jaguars history. He formerly served as a scout for the Indianapolis Colts for 10 years from 1998–2007. His first task with the team was to lead the interview process for a new head coach. Nine days later former Seattle Seahawks defensive coordinator Gus Bradley was named head coach of the Jaguars. The Jaguars struggled early on in 2013 and went into the bye week with an 0–8 record. On November 1 Justin Blackmon was suspended indefinitely after violating the NFL's Policy and Program for Substances of Abuse. Despite the loss of Blackmon the Jaguars got their first win with Gus Bradley on November 10 with a 29–27 victory over the Tennessee Titans. This was followed by a respectable showing against the Arizona Cardinals, despite a 27–14 loss, and the Jaguars' second and third victory of the season against the Houston Texans and the Cleveland Browns. The Jaguars would win again the very next week against the Houston Texans 27–20 on Thursday night, improving to 4–9. They finished the season 4–12. Blake Bortles handing off to Toby Gerhart in December 2014. After finishing the 2013 season with a 4–12 record, a two-win improvement over the previous season, the Jaguars traded their 2011 NFL draft first round draft pick Blaine Gabbert to the San Francisco 49ers for the 6th round pick of the 2014 NFL draft. Maurice Jones-Drew, after 7 years with the Jaguars, also left the team and signed a three-year contract with the Oakland Raiders. In the first round of the 2014 NFL draft the Jaguars selected quarterback Blake Bortles from University of Central Florida and then wide receiver Marqise Lee from University of Southern California in the second round. The new draft picks helped put more confidence in the struggling team. Justin Blackmon was suspended yet again for violating the NFL's Policy and Program for Substances of Abuse in July. 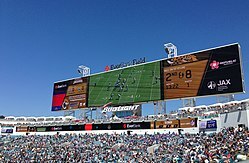 Later in July, EverBank Field unveiled their two new endzone scoreboards, which are considered to be the world's largest. The Jaguars managed to end their season with a 3–13 record. Dante Fowler Jr. was selected by the Jaguars as the third overall pick in the 2015 NFL draft. However, Fowler tore his ACL at rookie minicamp on May 8 and did not return for the 2015 season. Josh Scobee was traded to the Pittsburgh Steelers for a 2016 NFL Draft sixth round pick. Jason Myers took over as the main placekicker for the Jaguars. The Jaguars finished the 2015 season with a record of 5–11, the team's fifth straight losing season and their eighth straight non-winning season. The Star-Spangled Banner performed before a Jaguars game at EverBank Field in 2015. With plenty of cap space to work with, Jacksonville splurged in free agency, adding defensive tackle Malik Jackson from the Denver Broncos and cornerback Prince Amukamara from the New York Giants. With the fifth selection, the Jaguars selected cornerback Jalen Ramsey from Florida State University in the first round and then the second round linebacker Myles Jack of UCLA in the 2016 NFL Draft. Jack was considered to be a top-10 talent, but fell to the second round due to a knee injury. On October 2, 2016, the Jacksonville Jaguars defeated the Indianapolis Colts 30–27 in the NFL International Series game. On December 18, 2016, Gus Bradley was fired after the Jaguars' ninth loss in a row during the 2016 season. Bradley's W-L record as head coach of the Jaguars was 14–48 in three seasons. On January 9, 2017 the Jaguars announced the interim head coach Doug Marrone was to be the new head coach, the contract of General Manager David Caldwell was to be extended and Tom Coughlin was returning to Jacksonville to become Executive Vice President of Football Operations. Both Doug Marrone and David Caldwell report to the Executive Vice President Tom Coughlin. After their week 15 win over the Houston Texans, the Jaguars clinched their first playoff appearance since 2007; they finished the season 10–6, enough to win the division for the first time since 1999. It was a seven-game turnaround from the previous year. The Jaguars defeated the Buffalo Bills 10–3 in Jacksonville, marking their first playoff win in ten years. In the Divisional Round, on January 14, 2018, the Jaguars defeated the Pittsburgh Steelers 45–42 in Pittsburgh, their second win at Heinz Field that season, to advance to their 3rd AFC Championship Game, and their first in 18 years. After leading most of the game, they narrowly fell to the New England Patriots 24–20. For the season, the defense earned the nickname "Sacksonville" because of its dominance. In the first round of the 2018 NFL Draft the Jaguars selected defensive tackle Taven Bryan of University of Florida and wide receiver DJ Chark of LSU in the second round. The Jaguars traded Dante Fowler Jr. mid-season to the Los Angeles Rams for a 2019 third-round pick and 2020 fifth-round pick. The day after the NFL awarded the expansion team to Jacksonville, a triumphant Wayne Weaver held up the Jaguars' proposed silver helmet and teal jersey at the NFL owners' meeting in Chicago. The team's colors were to be teal, gold, and silver with black accents. However, this jersey and helmet design, with a gold leaping jaguar, created controversy. Ford Motor Company, then-parent of the automaker Jaguar, believed that the Jaguars' logo bore too much resemblance to the automaker's logo. Though no lawsuit was brought to trial, lawyers from the team and the automaker negotiated an ultimately amicable agreement whereby Jaguar would be named the official car of the Jaguars, and the Jaguars would redesign their uniforms. The Jacksonville Jaguars uniforms, worn by Jaguars players from 2013–2017. The helmet, first of its kind in the NFL, featured a glossy gold finish in the back that fades to matte black in the front, via a color gradient. In November 2015, as one of eight teams participating in Nike's "Color Rush" initiative for four games of Thursday Night Football during the 2015 season, Jacksonville introduced an all-gold second alternative uniform. The set features a gold jersey with black sleeves and black trim, as well as all gold pants. The white front and back numbers are lined in the teal accent color and bordered by black. The TV numbers on the shoulders are white with black bordering. The set also features gold undershirts and socks. On April 19, 2018, the Jaguars again revealed re-designed uniforms. The new design returns to an all-black gloss helmet and removes many of the complicated details from the previous set. For the first time, there will be no borders at all on any of the jersey numbers. There are no stripes or team logo on the pants; only an NFL logo and a Nike logo, which is the first and only of its kind in the NFL. Like the 2009 uniform set, the only gold in the uniform set belongs to the Jaguar logo itself, and the block number font is not distinct from that used by other teams. The sleeve trim and collar trim are both a different color than the rest of the jersey, that and the solitary Jaguar logo are the only distinct markings on the jersey. For the first time, the sock has a teal stripe between the black and white. The black jersey is the primary, as it has been since 2012, and the teal is the alternate. Jaxson's first appearance was on August 18, 1996 and was played by Curtis Dvorak from his inception until his retirement in June 2015. In addition to performing at games and pep rallies, members function as goodwill ambassadors of the team, participating in corporate, community, and charitable events in the Jacksonville metropolitan area where they sign autographs and pose for pictures. They also join NFL tours to entertain American servicemen and women around the world. TIAA Bank Field, home of the Jacksonville Jaguars and the world's largest scoreboards. TIAA Bank Field (formerly known as Jacksonville Municipal Stadium, Alltel Stadium, and EverBank Field) is located on the north bank of the St. Johns River, and has been the home of the Jaguars since the team's first season in 1995. The stadium has a capacity of 69,132, with additional seating added during Florida–Georgia Game and the Gator Bowl. The stadium served as the site of Super Bowl XXXIX in addition to four Jaguar playoff games including the 1999 AFC Championship Game. It also hosted the ACC Championship Game from 2005–07 and the River City Showdown in 2007 and 2008. From 1995–97 and again from 2006–09, the stadium was named Jacksonville Municipal Stadium. From 1997–2006, the stadium was referred to as Alltel Stadium. The naming rights were purchased by EverBank prior to the 2010 season. Prior to the 2018 season the Jaguars announced the stadium would be renamed TIAA Bank Field. The stadium got a substantial upgrade in 2014 with the addition of new scoreboards, pools, cabana seating and premium seating that includes 180 field-level seats. The scoreboards are 60 feet high and 362 feet long. The new scoreboards at TIAA Bank Field are now the world's largest video boards. Two 25 feet by 12 feet pools were installed in the north and south end zones along with the cabana seating. The stadium upgrades were $63 million that owner Shahid Khan helped finance $20 million of the total cost. This is a partial list of the Jaguars' last five completed seasons. For the full season-by-season franchise results, see List of Jacksonville Jaguars seasons. Pride of the Jaguars display in TIAA Bank Field. Although not officially retired, the number 71 worn by offensive tackle Tony Boselli, the Jaguars' first-ever draft pick, has not been worn since his retirement in 2002. According to team officials, while the number is not in circulation, the number (along with Fred Taylor's number 28) is officially available for use if the circumstances warrant it. A contest was held in July 2006 to name the club's ring of honor and "Pride of the Jaguars" was chosen with 36% of the vote. It was unveiled during the 2006 season during a game against the New York Jets on October 8. Former offensive tackle Tony Boselli was the first player inducted. WJAX-TV or WFOX-TV televises all preseason games and also televises regular season games that are televised nationally on ESPN or NFL Network. ^ Sexton, Brian (November 4, 2014). "Jaguars History". Jacksonville Jaguars. Archived from the original on November 6, 2014. Retrieved May 21, 2018. ^ a b Jaguars Public Relations (February 5, 2013). "Jaguars introduce new brand identity and campaign". Jacksonville Jaguars. Archived from the original on February 8, 2013. Retrieved May 21, 2018. ^ "Jacksonville Jaguars Team Capsule" (PDF). 2018 Official National Football League Record and Fact Book. NFL Enterprises, LLC. August 9, 2018. Retrieved September 17, 2018. ^ "Jacksonville Jaguars Team Encyclopedia". Pro-Football-Reference.com. Sports Reference LLC. Retrieved January 25, 2016. ^ "Pakistani-born Khan approved as Jaguars' new owner". National Football League. Associated Press. December 14, 2011. Retrieved January 25, 2016. ^ Ozanian, Mike (November 29, 2011). "Jacksonville Jaguars Sold To Illinois Businessman For $770 Million". Forbes. Retrieved January 25, 2016. ^ Kurt Badenhausen. "Shahid Khan – Forbes". Forbes. ^ "Alltel Stadium — BNI Engineers". BNIEngineers.com. Bliss & Nyitray, Inc. Retrieved May 10, 2016. ^ Dame, Mike. "Gator Bowl moves to Gainesville for one year", South Florida Sun-Sentinel. January 28, 1994. Page C4. ^ Sexton, Brian (February 15, 2015). "On This Day: Expansion Draft 1995". Jacksonville Jaguars. Archived from the original on February 17, 2015. Retrieved May 21, 2018. ^ a b c "All Articles - jaguars.com". Retrieved June 21, 2016. ^ "Thigpen Drops Crown On Packers' Heads". AP. December 25, 1995. Retrieved June 21, 2016 – via The New York Times. ^ "Andersen's Miss Puts Jaguars in Postseason". Chicago Sun-Times. December 23, 1996. Archived from the original on May 16, 2011. Retrieved November 5, 2007. ^ Allan, Scott (December 21, 2010). "Biggest playoff upsets in NFL history". Sports.yahoo.com. Retrieved September 3, 2012. ^ On, Esteban (January 10, 2012). "11 Biggest NFL Playoff Upsets". Totalprosports.com. Retrieved September 3, 2012. ^ "NFL Top 5: Biggest playoff upsets". Covers.com. Retrieved September 3, 2012. ^ "Stop talking about the 1996 season". Big Cat Country. October 19, 2015. Retrieved November 22, 2015. ^ Ruppel, Chris (November 22, 2015). "New York Jets Throwback Thursday: Playoff Home Cookin'". Vox Media. Retrieved November 22, 2015. ^ Law, Zach (May 18, 2012). "Tennessee Titans Classic Games: 1999 AFC Championship vs. Jacksonville Jaguars". Bleacher Report. Retrieved November 22, 2015. ^ "History of the Wild Card". profootballhof.com. Retrieved November 22, 2015. ^ "2004 Jacksonville Jaguars". pro-football-reference. Sports Reference LLC. Retrieved November 23, 2015. ^ "Patriots throttle Jaguars as champs begin title defense". ESPN. January 8, 2006. Retrieved November 23, 2015. ^ "2006 NFL Draft". pro-football-reference.com. Sports Reference LLC. ^ "Expert picks: Cowboys, Chargers on collision course?". August 28, 2008. Retrieved June 21, 2016. ^ "Fred Taylor Retires as a Member of the Jacksonville Jaguars". Archived from the original on July 30, 2012. Retrieved January 5, 2012. ^ "2009 NFL Football Attendance". ESPN. Retrieved January 22, 2012. 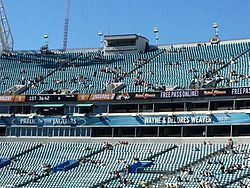 ^ "Goodell: Jaguars' attendance "a concern"". news4jax.com. Associated Press. February 5, 2010. Archived from the original on February 9, 2010. Retrieved December 16, 2010. ^ Tania Ganguli (November 29, 2011). "Jaguars being sold, Jack Del Rio fired". The Florida Times-Union. Retrieved November 29, 2011. ^ "Khan era begins". Jacksonville Jaguars. January 5, 2012. Archived from the original on January 9, 2012. Retrieved May 21, 2018. ^ Ganguli, Tania. "Jaguars hire Mark Lamping as team president". jacksonville.com. Retrieved September 3, 2012. ^ Oesher, John (January 14, 2012). "Tucker, Bratkowski named coordinators". Jacksonville Jaguars. Archived from the original on January 16, 2012. Retrieved May 21, 2018. ^ "NFL to hold three games in London in 2014". firstcoastnews.com. October 8, 2013. Retrieved October 21, 2013. ^ "NFL extends agreement to play regular-season games at Wembley Stadium for an additional five years". NFLUK. National Football League. Retrieved October 26, 2015. ^ Oehser, John (January 8, 2013). "Caldwell named Jaguars General Manager". Jacksonville Jaguars. Archived from the original on January 11, 2013. Retrieved May 21, 2018. ^ "Gus Bradley named head coach of Jaguars". Jacksonville Jaguars. January 18, 2013. Archived from the original on January 20, 2013. Retrieved May 21, 2018. ^ O'Halloran, Ryan. "Final drive stalls as Jaguars finish season 3–13 with loss to Houston". Jacksonville.com. Retrieved January 1, 2015. ^ Sessler, Marc (April 30, 2015). "Jaguars select Dante Fowler Jr. with No. 3 overall pick". NFL. Retrieved September 20, 2015. ^ Daniels, Tim (May 8, 2015). "Dante Fowler Jr. Injury: Updates on Jaguars DE's Knee and Return". Bleacher Report. Retrieved September 20, 2015. ^ DiRocco, Mike (August 31, 2015). "Jaguars trade kicker Josh Scobee to Steelers". ESPN. Retrieved November 21, 2016. ^ Brinson, Will (April 30, 2016). "2016 NFL Draft: Jaguars win with big D additions, Eagles empty-handed". CBS Sports. Retrieved May 1, 2016. ^ "Jaguars 30-27 Colts: NFL Wembley win for Jacksonville as Blake Bortles stars". BBC. October 2, 2016. Retrieved October 17, 2016. ^ Rosenthal, Gregg (December 18, 2016). "Gus Bradley fired by Jacksonville Jaguars". National Football League. Retrieved December 19, 2016. ^ Oehser, John (January 9, 2017). "Doug Marrone new head coach; Tom Coughlin returns". Jacksonville Jaguars. Archived from the original on January 10, 2017. Retrieved May 21, 2018. ^ "Jaguars select RB Leonard Fournette with No. 4 pick in NFL draft". USA Today. April 27, 2017. Retrieved April 28, 2017. ^ "Trump NFL row: Defiance after US president urges boycott". BBC. September 24, 2017. Retrieved September 24, 2017. ^ Wagner-McGough, Sean. "Jaguars president apologizes for kneeling during national anthem in London". CBS Sports. Retrieved November 13, 2017. ^ DiRocco, Michael (January 7, 2018). "Jaguars survive Bills -- and Blake Bortles, the passer -- for first playoff win since '07 season". ESPN. Retrieved January 7, 2018. ^ Reyes, Lorenzo (January 14, 2018). "Jaguars handle Steelers, crash AFC Championship Game party". USA Today. Retrieved January 24, 2018. ^ "Patriots rally late, end Jaguars' season in AFC title game". The Florida Times-Union. January 21, 2018. Retrieved January 25, 2018. ^ Zucker, Joseph (April 26, 2018). "Jaguars Grab Taven Bryan in 2018 NFL Draft and Twitter Loves the Pick". Bleacher Report. Retrieved April 27, 2018. ^ Stites, Adam (October 30, 2018). "Rams push chips to the middle of the table with a trade for Dante Fowler Jr". SBNation. Retrieved November 2, 2018. ^ "Nick Foles signs four-year deal with Jacksonville Jaguars". NFL.com. Retrieved 2019-03-22. ^ Oehser, John (February 6, 2013). "A new logo for a new era". Jacksonville Jaguars. Archived from the original on February 8, 2013. Retrieved May 21, 2018. ^ "AFC South". Retrieved June 21, 2016. ^ "Jaguars continue their offseason overhaul with new uniforms, logo". NFL.com. NFL Enterprises, LLC. November 23, 2015. Retrieved November 23, 2015. ^ Jaguars Public Relations (September 27, 2012). "Teal to become Jaguars' alternate jersey". Jacksonville Jaguars. Archived from the original on October 1, 2012. Retrieved May 21, 2018. ^ Jaguars Public Relations (April 23, 2013). "Jacksonville Jaguars and NIKE Unveil New Uniform Design for 2013" (Press release). Jacksonville Jaguars. Archived from the original on April 25, 2013. Retrieved May 21, 2018. ^ Sessler, Marc (April 23, 2013). "Jacksonville Jaguars unveil their new team uniforms". NFL.com. NFL Enterprises, LLC. Retrieved April 24, 2013. ^ "Color Rush: Four Games. Eight Teams. A Bold New Look for Thursday Night". Nike.com. 2015. Retrieved November 17, 2015. ^ Jaguars Public Relations (April 19, 2018). "Jaguars unveil new Nike Vapor Untouchable uniforms". Jacksonville Jaguars. Retrieved September 17, 2018. ^ Shook, Nick (April 19, 2018). "Jacksonville Jaguars unveil new old-school look". NFL.com. NFL Enterprises, LLC. Retrieved August 7, 2018. ^ Jacksonville.com (1999). "Jaxson De Villain". Jacksonville.com. Retrieved September 29, 2007. ^ Michael David Smith (2007). "Jaguars Mascot Jaxson de Ville Draws Ire of Colts President Bill Polian". sports.aol.com. Retrieved November 18, 2007. ^ Fox 30 Online (2007). "Jaguars Mascot Busted For Not Following Rules". Fox30.online.com. Retrieved November 18, 2007. ^ Teneshia L. Wright (2001). "Alltales: "Singer's Streak Hits Seven"". Jacksonville.com. Retrieved September 29, 2007. ^ Jaguars Press Release (2001). "Jaxson de Ville, the ROAR to Travel to Middle East to Visit U.S. Armed Forces". Jaguars.com. Retrieved September 29, 2007. ^ Heilman, Phillip (February 16, 2018). "New name for Jaguars' stadium: TIAA Bank Field". Jacksonville.com. Retrieved February 17, 2018. ^ Kuharsky, Paul. "Best divisional rivalry: Jaguars vs. Titans – AFC South Blog – ESPN". Espn.go.com. Retrieved September 3, 2012. ^ "2013 NFL Record and Fact Book". Retrieved November 3, 2017. ^ Oehser, John. "Brunell to enter Pride of the Jaguars". Jaguars.com. Jaguars. ^ "Jaguars Foundation - Jaguars.com". Retrieved October 9, 2012. ^ "Jaguars Media Guide – Foundation" (PDF). Retrieved October 9, 2012. ^ "Jaguars Foundation". Jaguars.com. Jaguars. Retrieved November 23, 2015. ^ "Tom Coughlin Jay Fund – Leadership". Tom Coughlin Jay Fund Foundation. Archived from the original on September 27, 2016. ^ "It's official: Jaguars change stations on radio, TV". The Florida Times-Union. March 19, 2014. Retrieved January 25, 2018.